Organizing a ‘beat down’ style run for your birthday is an art form. First, your idea has to be crazy enough to be worthy of a birthday and just intriguing enough for friends to think it might be fun. Second, it has to have a catchy name. And last — or really first probably — you have to make friends with stupid people. My Nashville friends and I have traveled to run the Fiery Gizzard trail, Savage Gulf or the Sewanee Perimeter trail at various times during the year for some time now. These trails have served as a break from our many loop-ty loops on the trails at Warner Parks. Cody Goodwin and I years ago had conversations about how to link up various versions of the trails in one continuous run – those were short lived conversations. Too much road running. So as I thought about something special to do this year as a follow up to last year’s Pancakes to Poker run from Gatlinburg to Cherokee via the Smoky Mountain National Park trails, this thought of doing all three in one day reappeared in my head. 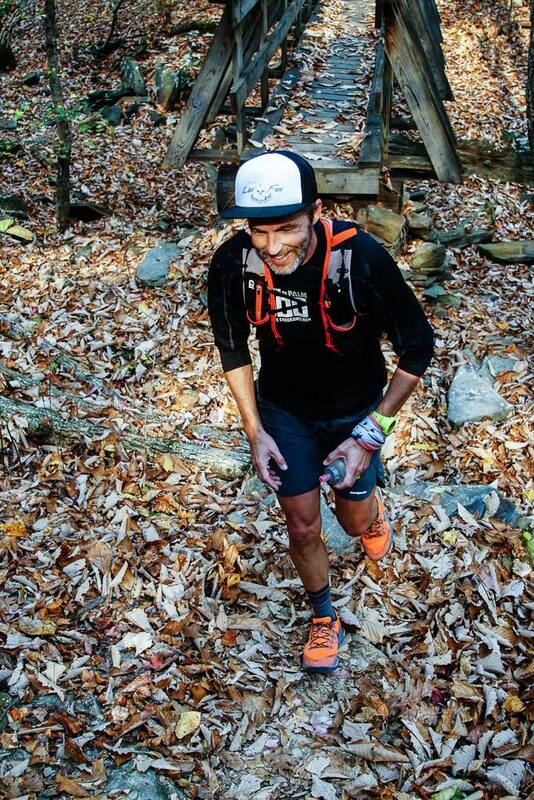 – Ryne Anderson – Nashville Running Company race team, completed San Juan Solstice, 4th Place at Stump Jump 50K, 3rd Place at Upchuck 50K, formerly had the nickname of Flyin’ Ryne. – Franklin Baker – Rock/Creek race team, 2nd Place at Upchuck 50K, 1st Place at Cloudland Canyon Half, 6th Place at Georgia Death Race, agreed to the run without knowing what we were doing. – Chris Luberecki – Token old dude, multiple Wasatch 100 finishes (with a top 10), 22 hour Western States finish, multiple Quad Dipsea finishes, had a bear get stuck in his truck once. – Olaf Wasternack – Fleet Feet Nashville race team – currently 8th on the US 24 hour race team list with 140 miles in 24 hours, has cookie speed. As a birthday run, the numbers were meaningless. Contrary to public opinion, the miles didn’t add up to my age. The idea of running the trails together did make sense to me as a reminder of life within a special day. The first leg had a few rough patches, but mostly it was forward progress on a relatively easy path just like birth through the college years – the last few miles of Fiery Gizzard being the hardest is reminiscent of those college days. Savage Gulf is the most brutal and beautiful trail in Tennessee and from the early twenties through the forties, life is also a brutal mess as there are a million things that need to be done. Clip coupons for Ramen noodles, find a suitable life mate that will allow a running obsession to continue, have kids, get the young kids to practices, climb the corporate ladder, don’t ruin your kids, buy a car, buy a house, mow the yard, fix crumbling roof in new house, buy kids a dog and then be stuck caring for it, and on and on. These times are wonderful, but sometimes they go by with the smoothness of giving a cat a bath. As life settles into what it’s going to be, life gets easier, maybe not in difficulty level, but in understanding. And the Perimeter Trail symbolized that for us. As we reached the long runnable section of this trail from about 3 miles in to about 5 miles from the finish, it was wonderful to finally let the legs run. Until we realized we were 50 miles into a hard day, then things began to get real. I guess that’s what it feels to be old. I wouldn’t know since I’m not old yet. As for the run, this one was pretty tame. Cody and Olaf quit after the first 13 miles with other engagements to attend. Or maybe the blistering pace put them at their limit. We clunked our way through Savage Gulf and Chris’s back stiffened on him. He would tell you it was because he carried all of us the first few miles, but he would be lying. Jeff’s heart rate began racing to unhealthy numbers. I’m no doctor so I told him to just take off the heart rate monitor. Daniel stopped eating about seven hours before we finished due to a bad stomach and eventually upchucked whatever was left in there inside the final five miles of the day. Nathan told me he ‘was going to destroy himself’ when we stopped for real food between Savage and Perimeter. Kyle, Daniel and I ran out of water prior to the final hellish climb at Savage. The cool thing about running with experienced guys like this is that none of us panicked, we all just looked at each other and decided to get on with the getting on – we would just suffer. It was after all The Show. After Savage was finished, Ryne called his wife Marcelle who informed him that ‘the bean dip was out of the oven’. This was not code for anything. The bean dip was literally out of the oven. Ryne chose to forego running Perimeter to go back to the cabin and eat bean dip. As we ran Perimeter under the most amazing moon lit sky, one of the guys asked how someone could trade the view for bean dip. I think it was Nathan, who has never said an unkind word about anyone not named Sam Hammonds, said “I hope Ryne is currently blowing bean dip out of every orifice.” And that’s how you go from having a cool nickname like ‘Flyin’ Ryne’ to forever being known as ‘Bean Dip’. In the end, five of us completed the day – Daniel, Franklin, Nathan, Kyle and myself. I don’t know of anyone who has done all three of these trails in one day – why would they? So we are claiming the FKT even though we stopped at the Mountain Goat Market to eat sandwiches and to drink all the carbonated beverages in the store and “ran” the last ten miles of the Perimeter Loop thirty minutes slower than my fastest time on the whole 19 mile loop. It was a full day of smiles, laughter and beautiful views. It’s good to have friends – and birthdays. All photos are property of Jobie Williams. Nice job, and Happy Birthday!! 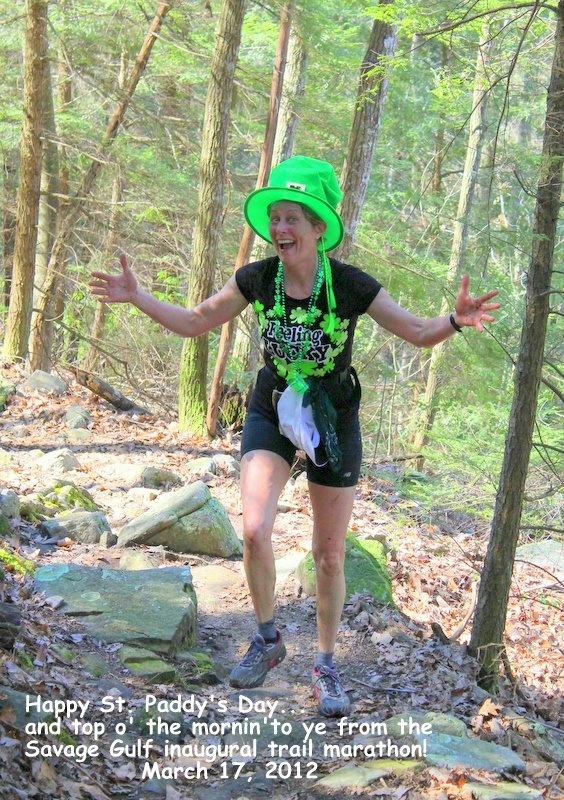 I completed the inaugural Savage Gulf Trail Marathon on St. Paddy’s Day in 2012 by the skin of my teeth, and it was a hellish experience considering I don’t “do” rocks. But at least I was the best dressed!